Listen to Henry Gray w/ Billy Boy Arnold & Jody Williams on "I Wish You Would"
Born in Kenner, Louisiana, Henry Gray was given his first piano lessons by a neighbor, Mrs. White, and though he was forbidden to play the blues at home, by the age of 16 he was already playing the honky-tonks. 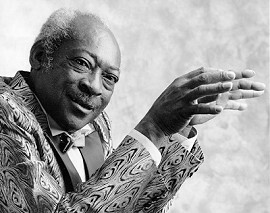 After serving in the Army During World War II, Gray migrated to Chicago in 1946 where he fell in with the great Big Maceo Merriwether, who taught him the two-fisted style of playing that he still uses to great effect today. Henry started out with Little Hudson's Red Devil Trio before moving on to gigs with Little Walter, who nick-named the young pianist "Bird Breath." Henry joined up with Howlin' Wolf in 1956 and stayed with him for a dozen years, cutting his own records along the way and working sessions with Jimmy Reed, Little Walter, Bo Diddley, Jimmy Rogers, Billy Boy Arnold and other Chess and Vee-Jay artists. Moving back to Louisiana in '68, Henry continued to cut records, as well as doing session work for J.D. Miller. Now residing near Baton Rouge, he still pounds a mean boogie. His heavy-handed piano antics have recently enhanced albums by Tab Benoit, Clarence Edwards, and Lafayette Leake.